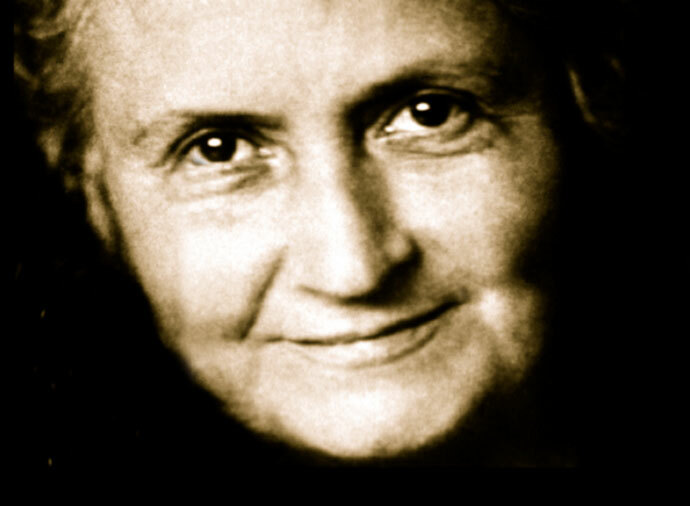 Maria Montessori lived from 1870 to 1952. She was the first woman to attend medical school and the first female Doctor of Medicine in Italy. Through her work with the handicapped and socially deprived children, she developed her unique educational method, known as the Montessori Method. As a result of her further study, observation and experimentation, she found the principals of her method to be applicable to all children. She had a huge impact on the field of education in general and the way we understand and teach children today. Maria Montessori stated that children have a natural tendency to learn. Those stages of learning exist for which there should be corresponding education environments and appropriately trained teachers to prepare the environment. The child learns independently using the components of this and the teacher is the link between the child and the environment. 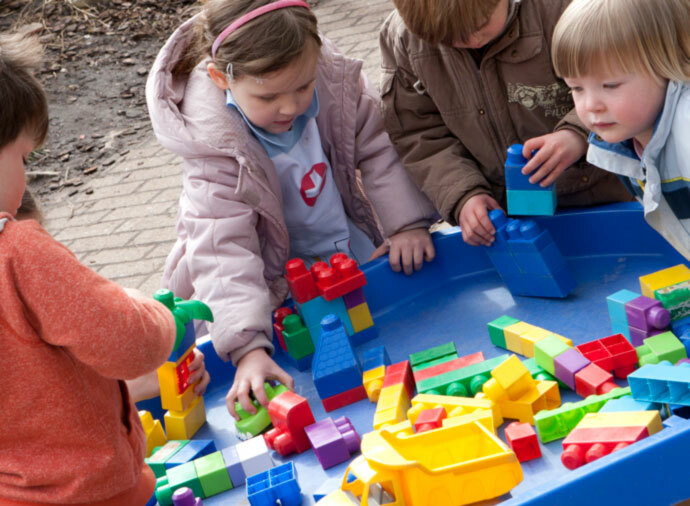 The learning environment cultivates individualisation, freedom of choice, concentration, independence, problem solving abilities, social interaction, disciplinary breadth and competency in basic skills. In a true Montessori school, you will find independent children who not only do things for themselves but also think for themselves. You will find children who have learnt how to explore and solve problems for themselves. And you will see small children helping each other and putting things away without being asked. As children learn to read, write and count they also learn how to persevere, to accept guidance and to make choices. Through this learning process children develop a love for knowledge and discover their unique talents. 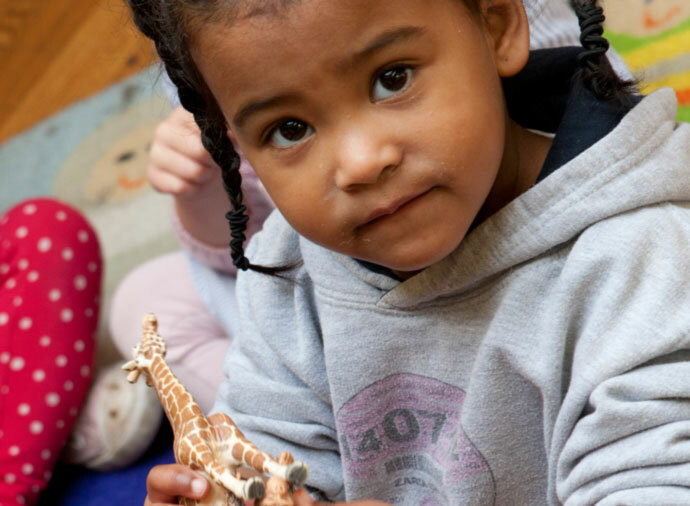 Little Tots recognise this and guide your child with care through the crucial stages of his or her educational journey. The young child has a unique aptitude for learning, which Dr. Montessori defined as the ”Absorbent Mind”. The mind of the young child quite literally absorbs information from the environment: for example, consider the way in which two year old children learn their native language, without formal instruction or conscious tedious effort. Acquiring information in this way is a natural and delightful activity for young children, who employ all their senses to investigate their interesting surroundings. These activities are designed to enable the child to feel secure. Practising skills such as buttoning or polishing, children develop confidence and a belief in their own ability to control their environment. There is also plenty of opportunity for the children to practise a variety of differing tasks including washing up, sweeping, mopping up spills, washing and hanging up of small items of clothing and cloths. 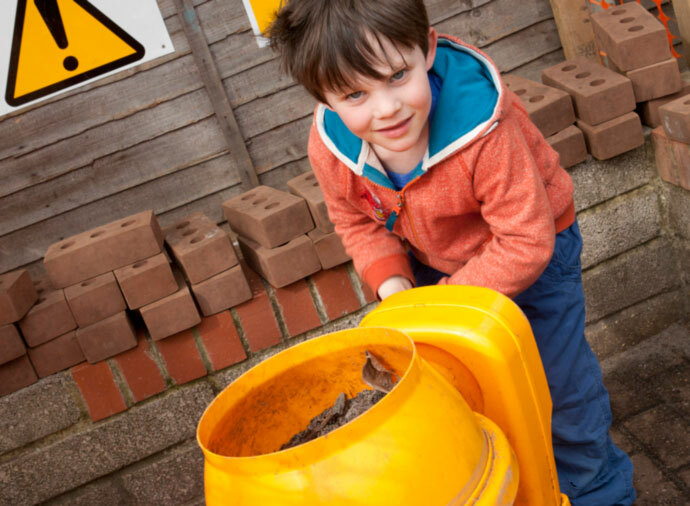 Children are encouraged to tidy and clean up after themselves, putting them in control and enabling them to become independent. This equipment takes children a step further in their learning. Each piece isolates a single concept – such as length, breadth and seriation. Children learn through activity. Using the sensorial apparatus, which contains its own control of error, children are free to learn without fear of failure. The sensorial equipment aims to develop the child’s knowledge and understanding of the world as well as their own fine/gross motor control. 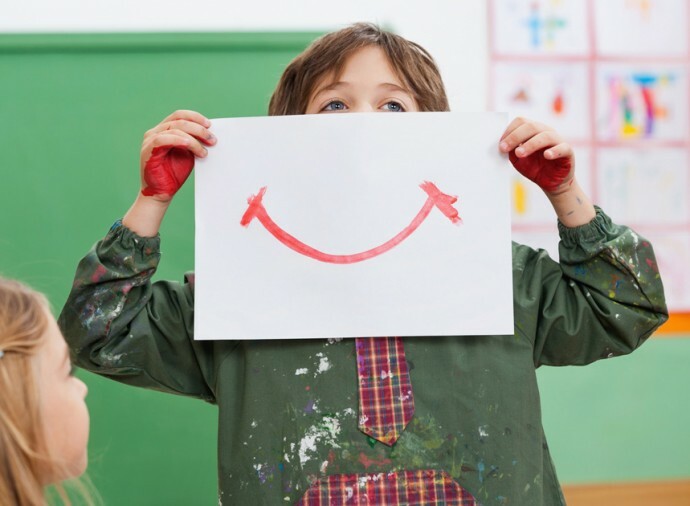 The materials foster independence, concentration, self-awareness, self esteem, self mastery, intellectual process and the development of language. 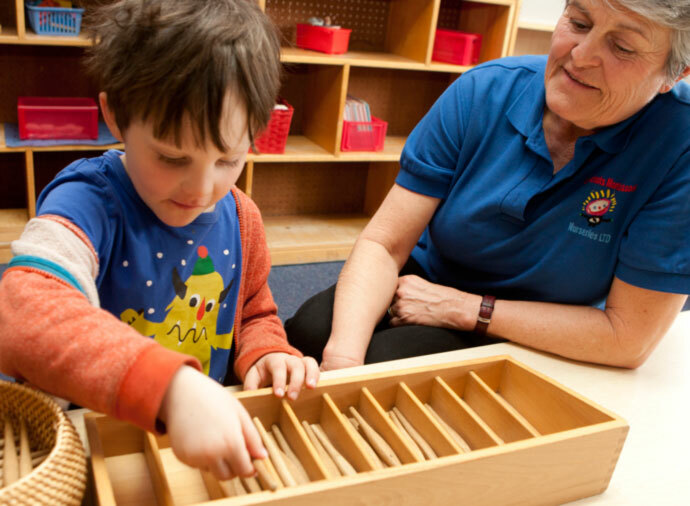 Montessori materials are available for early language activities. 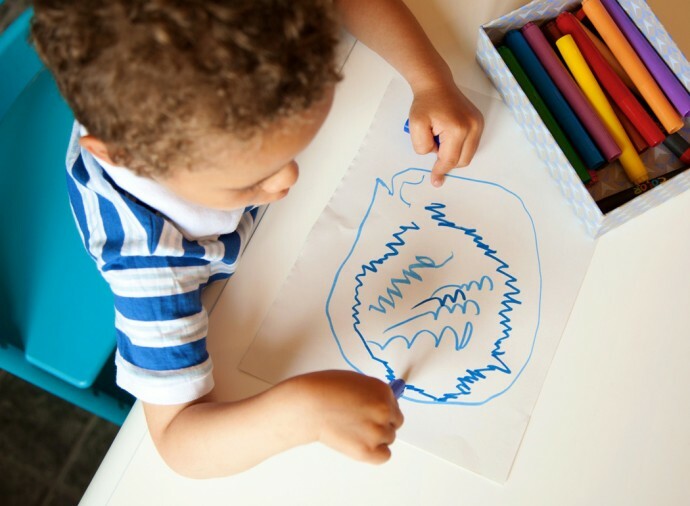 Children progress from auditory and visual perception games to sandpaper letters. They learn the common speech sounds of the alphabet and then how to build words, before going onto reading activities. 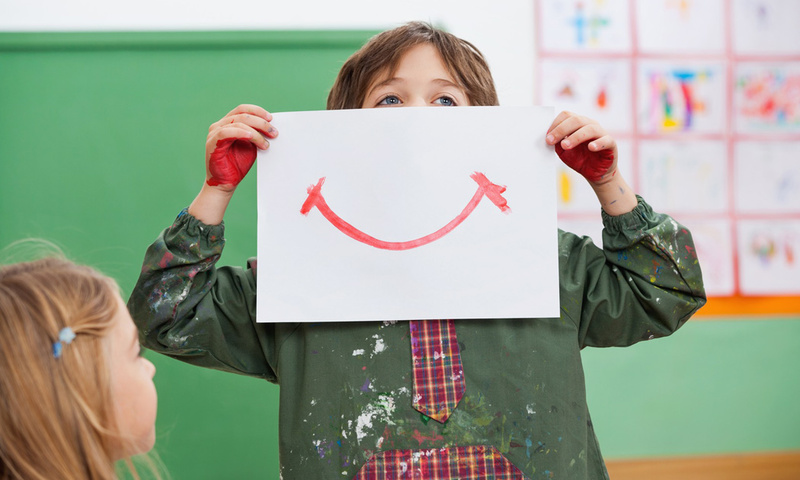 The process is structured carefully to lead children forward enthusiastically. Number materials take the child from the very early stages of recognising numbers and counting objects to more complex activities, such as the four mathematical processes and the importance of numbers in technologies. 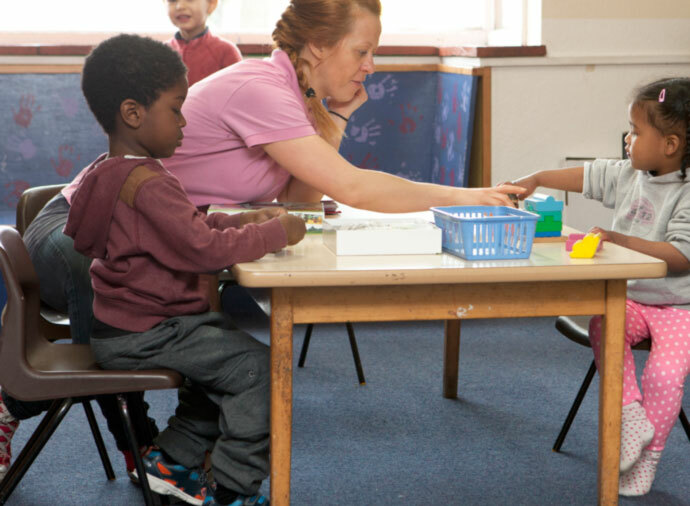 Children have many opportunities to practise pre-maths skills through practical activities. They gain confidence in counting and have an understanding of addition and subtraction. They learn to use mathematical ideas to solve problems and use comparative language such as big and little, heavy and light, less than, more than. They also develop a good understanding of shapes, positions, patterns and sizes, using appropriate language to describe these concepts.